Salaried class have always complained of raw deal year after year in income tax laws. But the good news is you can still manage to pay Zero (NIL) income tax on salary of up to Rs 20 lakhs (Salary here means cost to company). 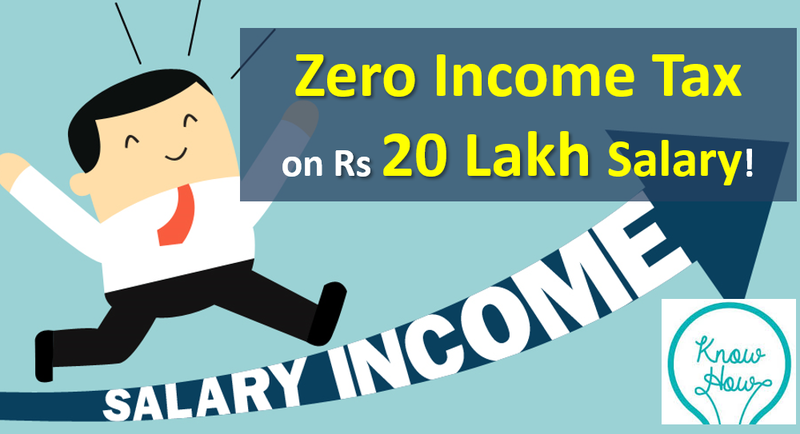 All you need to have is right salary structure and invest in RIGHT Tax saving plans! We give you details below. Salary structure is very important to keep taxes low. The good news is most employers are partially flexible with salary structure. We give you one such sample salary structure for CTC (Cost to Company) of Rs 20 lakhs. Car Maintenance – The company can reimburse Rs 1,800 per month for car less than 1600 CC (Rs 2,400 per month for bigger cars) along with Rs 900 per month for driver salary as tax free allowance. Transport Allowance is NO more tax free (Budget 2018) but Car Maintenance reimbursement is. We have shown the tax deduction on both HRA and Home Loan. There are people who think that both cannot be used simultaneously. This is NOT true. You can take benefit of both HRA and Home Loan even if your home and rented place is in the same city. Also Read: Can I claim Tax Benefit on both HRA & Home Loan? We have seen the salary structure and how you need to pay 0 income tax even when the CTC (Cost to company) is Rs 20.41 lakhs. Now lets look at how your Monthly Salary Slip would look like. Additionally Employee would get Food Coupons worth Rs 2,200 every month (which can be used for meals, eating out in restaurants or buying grocery). As you can see the monthly payout is not high and a lot of components are reimbursement. To balance this a lot of employers pay all reimbursement monthly and deduct taxes at the end of year if the bill is not submitted. How the Retirement Account looks? The drawback of the entire salary structure is that the monthly payout would be lower. In case you plan to have high monthly income, you’ll need to pay more taxes. We hope this would help you to restructure your salary (CTC) in a way that you can balance your tax outgo and monthly payout. Hi , I don’t have these options in my Salary can I claim this during filing the ITA form. Can I claim this during filing an ITA. Small clarity, As per your mentioned payslip, How much HRA exemption is calculated? it should be a least amount out of 3 category (HRA received from employer, Actual rent paid, 40% of basic). In this case, only 3,40,000 is eligible. I have a bought a property (LIG, Home) of Rs. 5.5 Lac in name pf my mother, 4 yr. earlier. Now I want to sell it at about 8.5 Lac to pay the mortgage loan of Rs. 7.20 Lac on it. Mother is a house wife, no source of income at all. Now pl. tell me the tax liabilities on selling this property. How can I save the same.